White flecks in the landscape tend to attract attention, especially in January. This irregular pattern is not a common site in Wakulla County’s earth toned countryside and manicured home sites. Most recall the great blizzard, at least by north Florida standards, of ’18 last year. White flecks of snow descended upon the area and speckled everything in sight, but did not last more than a few hours at most. Their significance was mostly to harried drivers on the way to work. Just the mere site of the icy crystals falling blinded some motorist and created hazardous driving conditions. White flecks in the home landscape can be an indication of a hazardous condition for commonly used shrubs. Armored scale is a class of insect pest found on many plants used in the county. 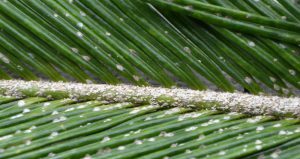 Scale insects are a diverse group of piercing-sucking pests (Hemiptera) commonly found on ornamental plants in landscapes and nurseries. They are small, inconspicuous insects which use hair-like mouthparts to remove and consume plant sap from leaves or branches. There are over 180 species of scale insects in Florida, but only a small percentage are important pests of ornamental plants. These insects can secrete a waxy covering that protects them from the environment and most chemical control measures. There are several families of scale insects, but they are usually divided into two main categories, armored or soft. Identifying the category is important because their biology differs, and so does their control. Armored scale insects feed on the contents of cells just under the surface of leaves and bark and excrete their waste to form a protective cover. This cover can be removed to reveal the soft-bodied insect feeding beneath. Cycads can be the home and feeding site of thousands of armored scale insects. This example has a severe infestation of the magnolia white scale, Pseudaulacaspis cockerelli, but can be controlled with horticulture oil application. Once female armored scales begin to feed on a host plant they will remain immobile in that location for the remainder of their life. Even after death, the scale insect cover can remain on the plant for several years. Armored scales are the most diverse group of scale insects in Florida with over 130 species. By comparison, there are only about 40 soft scale insect species in the state. Soft scales differ from armored scales in a few important ways. The waxy cover of soft scales is not separate from the insect’s body and cannot be removed. Unlike armored scales, female soft scales are mobile during every life stage until they begin to produce eggs. Soft scales feed on the phloem vascular tissue of plants which transports the soluble organic compounds made during photosynthesis. Honeydew, a sticky amber colored fluid, is excreted as waste. Most scale insect pests have a number of prey species which help control their populations. Among these are parasitoid wasps, ladybugs, lacewings, and others. To improve the potential of biological control insects being effective, provide habitat for these natural enemies, and increase the amount and diversity of plants in the landscape. Still successful biological control in home landscapes is difficult. While there are a number of scale insecticides on the market, a simpler more cost effective solution is available. Horticultural oils and dormant oils kill these insects by smothering them and breaking down their cell membranes. Horticultural oils can also penetrate the scale’s protective covers. These products can be applied now to kill overwintering scales. Of course always follow label instructions to avoid damaging plant tissue. While the deceased scale insect’s residue will last longer than snow in Wakulla County, it will be good to see it depart for the hereafter.